Grandma Opera is a charming and kooky 6 minute mini video opera by director Kenneth Hughes and composer Mark Hart. Hart’s music ranges from lyrical cabaret-style ballads to low power pop, all ably performed by Soprano Suzan Hanson in a big floppy hat. 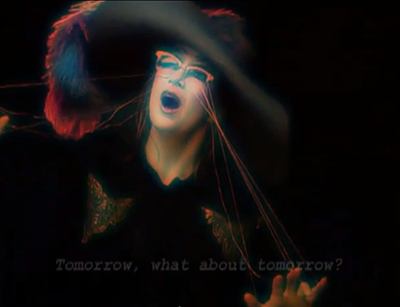 They lyrics are banal to the point of charming absurdity: “Under the ocean, what should we do? 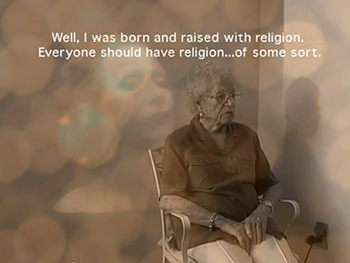 Floating in the ocean so deep and blue?” Images of soprano Hanson are intercut with an interview with a 94 year old grandmother (Annabelle McCarron), who offers sage advice from the perspective of her years: “Respect one another. Respect is the most important thing.” Cutaway shots of flowers and the moon complete the film’s greeting card aesthetic. Somehow, the combination of these seemingly unpromising elements, watered down operetta and the routine observations of an older woman not gifted with profound insight, combine to create a wacky, charming moment of lyricism. Is it the weird strings hanging from Hanson’s eyeglasses, or the color scheme which makes her look like an antique postcard image? McCarron observes how interesting it is to watch children growing up, and the song lyrics reply that it is “interesting to be seen.” Turning Grandma into an opera turns out to be a way to highlight the most important thing about her: the love she gives.